BONZINI Company, created in 1927, has been manufacturing a wide range of football tables for nearly 60 years. Our tables are appreciated by 3 generations. Our firm set up close to Paris is the French leader in the market of quality football tables. Our products supply 90% of the French market in the hotel industry, bars, clubs houses and leisure centres. We have been expanding our sales in new markets for these latest years: public service enterprises, schools, sports clubs and family market. We have already built more than 115 000 tables model B60 fitted out with coin mechanism device. As regards public services, colleges and family market we propose 2 models set up without coin mechanism system: model B90 and model Stadium. We export our range of tables to 60 countries on different continents. 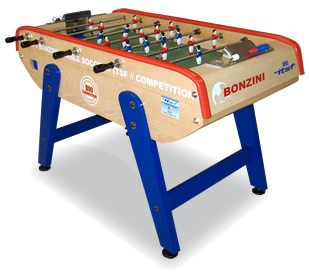 Bonzini is an official partner of the French Football Table Federation (FFFT) and ITSF. Our B90 ITSF model is our Official Competition Table.